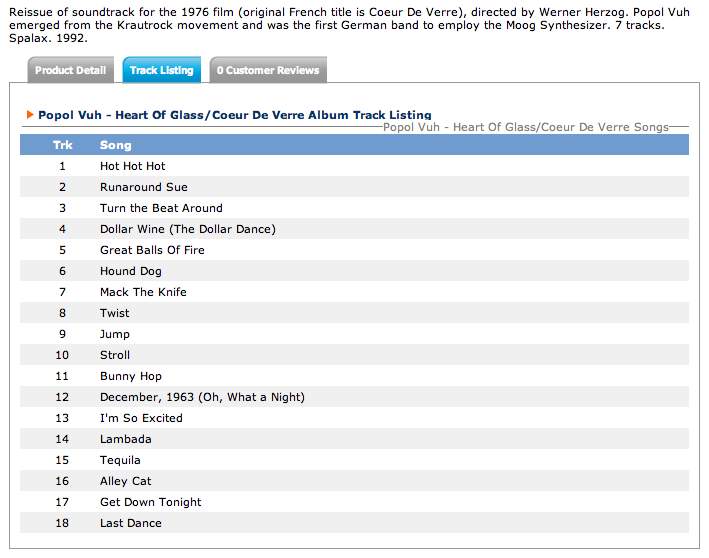 The 179th Soundtrack of the Week is Popol Vuh's music for Werner Herzog's Heart of Glass. 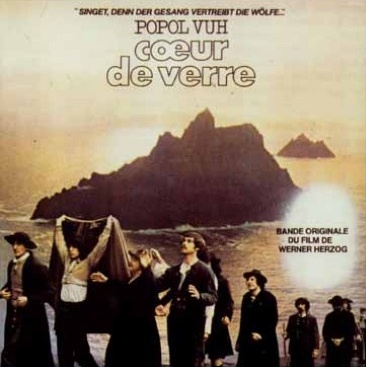 That's the original album cover but I have it as part of this box set of Popol Vuh's music for Werner Herzog movies. When I was a teenager I saw a lot of Herzog movies at the Brattle Theatre in Harvard Square. All I remember about Heart of Glass is that I slept through a lot of it. This seems somewhat appropriate since, for this movie, Herzog put all of the actors in trances before filming their scenes. However sleepy the movie might have made me, the soundtrack holds my attention. It begins with "Engel der Gegenwart", which takes its time getting started and uses electric guitars to create dreamy and dissonant atmospheres. It's similar to Howard Shore's music for Crash. Then the band launches into a groove that sounds agreeably like The Grateful Dead. "Blätt er aus dem Buch der Kühnheit" is a bit like a psychedelic rock version of a folk song or a national anthem, played not in the Hendrix style but quite soberly. Tambura, sitar and hand percussion are the instruments heard on "Das Lied von den hohen Bergen", a wonderfully droney piece. A heavier rock feel asserts itself in "Hüter der Schwelle". It builds in intensity very gradually, creeping up on the listener. The fade-out at the end is a bit disappointing. I was hoping for a big, cathartic krautrock ending. "Der Ruff" has the two electric guitars playing off each other as one creates a resonant, arpeggiated background for the other's lead lines. Electric bass and drums provide the foundation for them. It's momentous when the two guitars come together for a unison B section. The same instrumentation and similar arrange ment are used in the next piece, "Singet, denn der Gesang vertreibt die Wölfe". Flute joins the band for "Gemeinschaft", a tune in the style of "Blätt er aus dem Buch der Kühnheit". 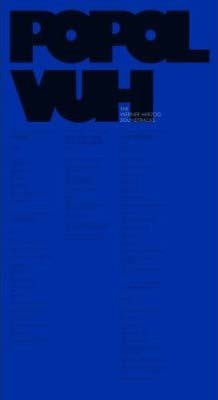 "Auf dem Weg — On the way (Alternative Guitar Version)" is a spacey, swirling, atmospheric piece for electric guitars. "The last piece, "Hand in Hand in Hand (Agape Guitar Version)" actually features acoustic guitars but is otherwise similar to "Auf dem Weg". This is a really great album. I wish it hadn't taken me so long to get around to hearing it! While looking around for a picture of the cover I came across this piece of internet stupidity.